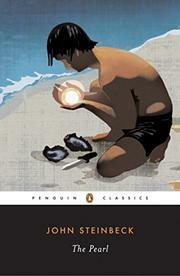 Steinbeck's peculiarly intense simplicity of technique is admirably displayed in this vignette -- a simple, tragic tale of Mexican little people, a story retold by the pearl divers of a fishing hamlet until it has the quality of folk legend. A young couple content with the humble living allowed them by the syndicate which controls the sale of the mediocre pearls ordinarily found, find their happiness shattered when their baby boy is stung by a scorpion. They dare brave the terrors of a foreign doctor, only to be turned away when all they can offer in payment is spurned. Then comes the miracle. Kino find a great pearl. The future looks bright again. The baby is responding to the treatment his mother had given. But with the pearl, evil enters the hearts of men:- ambition beyond his station emboldens Kino to turn down the price offered by the dealers- he determines to go to the capital for a better market; the doctor, hearing of the pearl, plants the seed of doubt and superstition, endangering the child's life, so that he may get his rake-off; the neighbors and the strangers turn against Kino, burn his hut, ransack his premises, attack him in the dark -- and when he kills, in defense, trail him to the mountain hiding place- and kill the child. Then- and then only- does he concede defeat. In sorrow and humility, he returns with his Juana to the ways of his people; the pearl is thrown into the sea.... A parable, this, with no attempt to add to its simple pattern.